Last Updated: 7/11/2012 | File Size: 16010 KB | License: Freeware | Downloads: 266 | Developer: Digiarty Software, Inc.
MacX Free MP3 Video Converter is a free MP3 converter for Mac users to convert all video, including AVI, MPEG, WMV, FLV, F4V, H.264/MPEG-4, MOV, RM, RMVB, VOB, ASF, 3GP, Google TV, WebM, Vpx 8, MP4 to MP3. You can use this free MP3 converter to extract MP3 audio from any kind of video files to listen to it when you are jogging, waiting for a bus, or killing the time on the flight. 1 This free MP3 converter for Mac supports converting HD videos M2TS, MKV, AVCHD, MOD, TOD and general video like AVI, MPEG, WMV, FLV, F4V, H.264/MPEG-4, DivX, XviD, MOV, RM, RMVB, VOB, ASF, 3GP, 3G2, QT, DAT, Google TV, WebM, Vpx 8, MP4 to MP3 audio format. 2. MacX Free MP3 Video Converter can get MP3 audio from the source video so that you can transfer to iPad, iPhone, iPod, Blackberry, Android, mobile phone, PSP, etc. 3. All the parameters of profile provided for you to customize the output audio quality, like sample rate, volume, etc. 4.It supports Multi-track HD video M2TS, MKV, AVCHD, HDTV BDAV and MPEG-TS that helps you to choose any audio language track to be converted to MP3. 5. 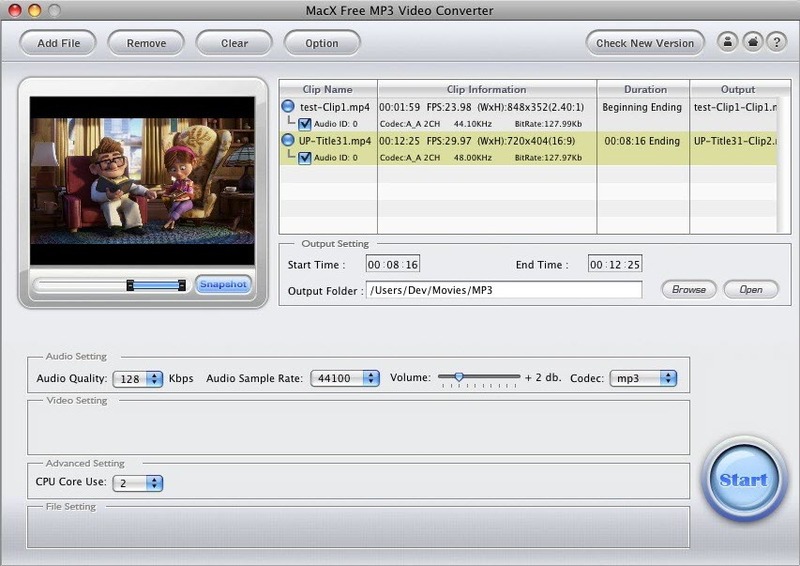 MacX Free MP3 Video Converter enables you to remove the unwanted part like advertisement, and convert video segment from the source video to MP3. 6.It is totally free yet 100% Clean with no functions reserved or time limit. Statement: First, please download the orginal installation package by clicking the download link. Of course you may also download it from the publisher's website. Using MacX Free MP3 Video Converter crack, key, patch, serial number, registration code, keygen is illegal. The download file hosted at publisher website. We do not provide any download link points to Rapidshare, Hotfile, Depositfiles, Mediafire, Filefactory, etc. or obtained from file sharing programs such as Limewire, Kazaa, Imesh, Ares, BearShare, BitTorrent, WinMX etc. Software piracy is theft. If you like MacX Free MP3 Video Converter please buy it.